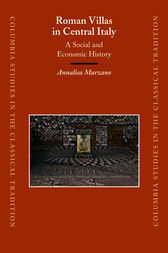 This volume investigates the socio-economic role of elite villas in Roman Central Italy drawing on both documentary sources and material evidence. Through the composite picture emerging from the juxtaposition of literary texts and archaeological evidence, the book traces elite ideological attitudes and economic behavior, caught between what was morally acceptable and the desire to invest capital intelligently. The analysis of the biases affecting the application of modern historiographical models to the interpretation of the archaeology frames the discussion on the identification of slave quarters in villas and the putative second century crisis of the Italian economy. The book brings an innovative perspective to the debate on the villa-system and the decline of villas in the imperial period.